Here is a nice new T-Mount Adapter for Canon EOS camera. Allows the use of T-Mount lenses, telescopes, bellows, and other accessories on your camera. It will fit every EOS camera made to date, current digital D-SLR and older film SLR cameras. It will not fit the FL or FD mount camera bodies. The T Mount is an older lens mount that has a threaded mount measuring 42mm like the Pentax Screw Mount lenses BUT it is not the same. The T Mount is a fine thread and the Pentax a coarse thread. The T Mount was used for a wide variety of items, not just lenses. Some of the other items with this mount are a slide copier, very long telephoto lenses up to 1000mm, spotting scope, binocular adapter, microscope, bellows units, telescopes, etc. The lenses are considered "aftermarket" and made by many different manufacturers. One thing I would like to point out about these lenses. They were made at a time when everyone shot slides. As you know slide film is not as forgiving as print film or digital photography. The lenses had to be good or the results were bad and the lenses would not sell. My own experience with these lenses has found them to be quite capable and very sharp. The lenses are plentiful and inexpensive. You will of course loose the auto focus ability, all T Mount lenses are manual focus. You will also loose the auto and program modes, the only way to use it is metered manual and manually stop down the lens for metering and shooting. If you have priced a long telephoto lens lately, 400mm or longer you will see what a terrific bargain this ring and a T Mount lens will be for your camera. I will guess you can get both for less than $100.00. The most common use for them these days is to mount a 500mm or longer Mirror telephoto lens to a EOS digital or film camera. With the cost of new telephoto lenses it pays to buy a nice used T mount lens and this ring. Here is a nice new metal T-Mount Adapter for Canon FL and FD mount cameras. Allows the use of T-Mount lenses, telescopes, bellows, and other accessories on your camera. It is for the older 35mm film cameras. It will not fit the newer ES digital or auto focus film cameras. Here is a new TOP QUALITY metal adapter made in JAPAN. This allows the use T-Mount lenses (T2 mount), Spotting Scopes, Macro Bellows, and Telescopes on your Olympus D-SLR 4/3 Mount camera. The most popular ones now are E-300, E-330, E-410, E-420, E-500, E-510 and E-3. This will not fit the Olympus OM mount 35mm cameras. Here is a brand new in the box T-Mount Adapter for any Olympus OM focus camera. Allows the use of T-Mount lenses, telescopes, bellows, and other accessories on your camera. This will not work with the new Olympus EVOLT digital SLR cameras. 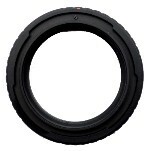 Here is a nice new metal T-Mount Adapter for Nikon digital or film camera. This ring allows the use of T-Mount lenses, telescopes, bellows, and other accessories on your camera. The T Mount is an older lens mount that has a threaded mount measuring 42mm like the Pentax M42 Screw Mount lenses BUT it is not the same. The T Mount is a fine thread and the Pentax a coarse thread. 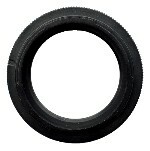 The T Mount was used for a wide variety of items, not just lenses. Some of the other items with this mount are a slide copier, very long telephoto lenses up to 1000mm, spotting scope, binocular adapter, microscope, bellows units, etc. The lenses are considered "aftermarket" and made by many different manufacturers. One thing I would like to point out about these lenses. They were made at a time when everyone shot slides. As you know slide film is not as forgiving as digital or print film. The lenses had to be good or the results were bad and the lenses would not sell. My own experience with these lenses has found them to be quite capable and very sharp. The lenses are plentiful and inexpensive. You will of course loose the auto focus ability, all T Mount lenses are manual focus. You will also loose the auto and program modes, the only way to use it is metered manual and manually stop down the lens for metering and shooting. If you have priced a long telephoto lens lately, 400mm or longer you will see what a terrific bargain this ring and a T Mount lens will be for your camera. I will guess you can get both for less than $100.00. The most common use for them these days is to mount a 500mm or longer Mirror telephoto lens to a Nikon Digital SLR like a D1H, D70, etc. camera. With the cost of new telephoto lenses it pays to buy a nice used T mount lens and this ring. It will fit every Nikon F mount cameras ever made. This of course includes the current digital cameras made today. Here is a brand new metal adapter ring that allows you to use T-Mount lenses, spotting scopes, telescopes, and macro bellows systems with your Sony Alpha DSLR-A100 or DSLR-A100K camera. It will also fit any other Sony Digital SLR camera that uses the Minolta Auto Focus lenses.